Preheat oven to 200°C / 390°F. Grease a smaller baking dish with a little bit of oil. Wash and dry plums and a nectarine, remove the pit and cut into slices. Add lemon juice, brown sugar, cinnamon to taste and 1 teaspoon of corn starch. Mix well to combine and place in the baking dish so as to cover the bottom of the dish. Prepare the crumble by mixing together the ingredients in a bowl, and using your fingers knead it into coarse crumbs. Sprinkle the crumble on top of the fruit in the baking dish. 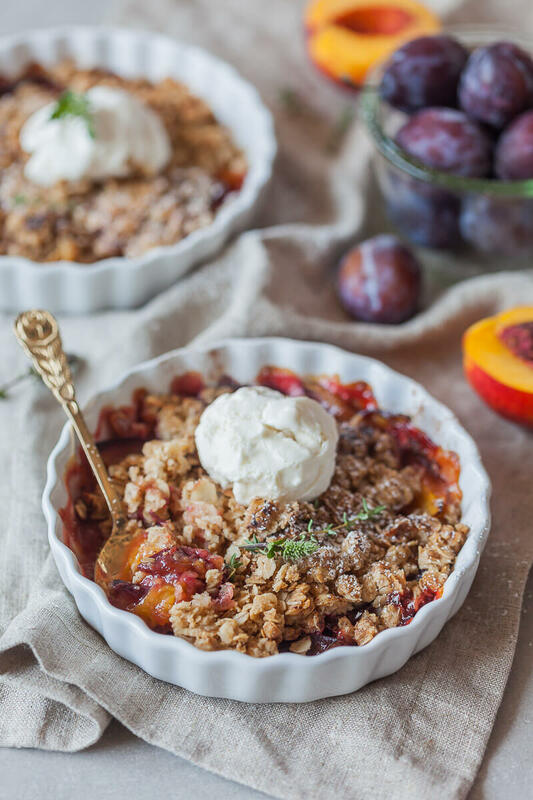 Place baking dish into the preheated oven and bake for about 30 minutes, or until the crumble turns crispy and golden brown, and the fruit turns soft. Remove from oven and set aside to cool a little bit. Serve with a sprinkle of icing sugar and a scoop of plant-based ice cream.